Dental implants have been at the forefront of dentistry since their inception in the mid-1960s. Dental implants are one of the most popular options when it comes to replacing teeth for their functionality and effectiveness. A dental implant is used to support crowns, replace single missing teeth, support bridge procedures and restore your smile all in one! The key to a dental implant is incorporating it with the patient’s jawbone. Without the jawbone, a dental implant is not possible. If you want a safe, effective, and convenient way to replace your lost teeth with a natural-looking result, consult with a specialist to see if dental implants are right for you. It is important to note that having a supportive jawbone is crucial to implant success. If you have any sort of periodontal issues or decay buildups, such as tartar or gum disease, those issues must be resolved before moving forward. A dental implant is essentially a titanium screw. This screw is placed into the jawbone, or a socket in your jaw, to act as a replacement tooth. This is why having a healthy jawbone is so important. Since the titanium surface of the implant fuses with the jawbone in a process known as osseointegration, your jaw needs to be clear of all issues to support stability and healing. It is important to note that dental implants and dental crowns usually work together. Usually, when someone gets a dental implant, they must wait a few months for the jawbone and bone marrow to heal before a crown is inserted. 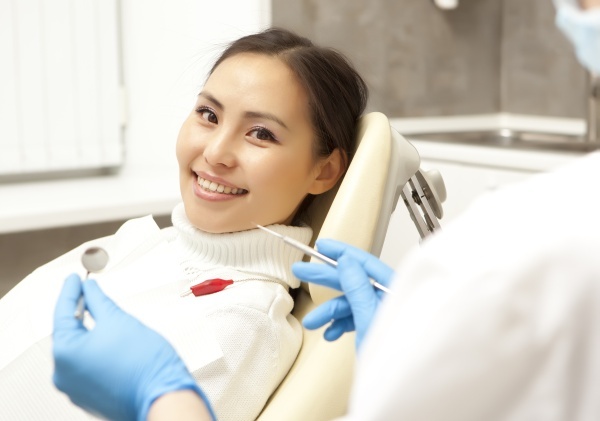 When used in conjunction, a dental crown and implant can do wonders for any smile. A dental implant imitates the root of a tooth which means it must be securely fastened to the jawbone. Thus, a dental implant is considered a permanent solution. The jawbone must also have sufficient density, also known as bone mass. The dentist or specialist will examine the bone mass to check for sustainability and support during the initial consultation. If the density is sufficient, patients will most likely be given the implant which will later be inserted into the jawbone for maximum stability. If patients lack the proper bone density, they will be given an Endosteal implant. This implant is placed into the gum and not the jawbone. This provides the security and stability that the procedure needs, without having to place any added pressure on the jawbone itself. If you are experiencing any issues with your jaw or tooth structure, you are more than likely capable of having some dental implant work done. Remember that your teeth and jaw play just as an important role in your life as anything else. Make sure you treat them properly! Are you considering a dental implant in the East Orange area? Get more information about a dental implant procedure at https://www.qualitygentledentalcare.com.